Sierra Design’s Cloud is a lightweight zipperless mummy style sleeping bag. 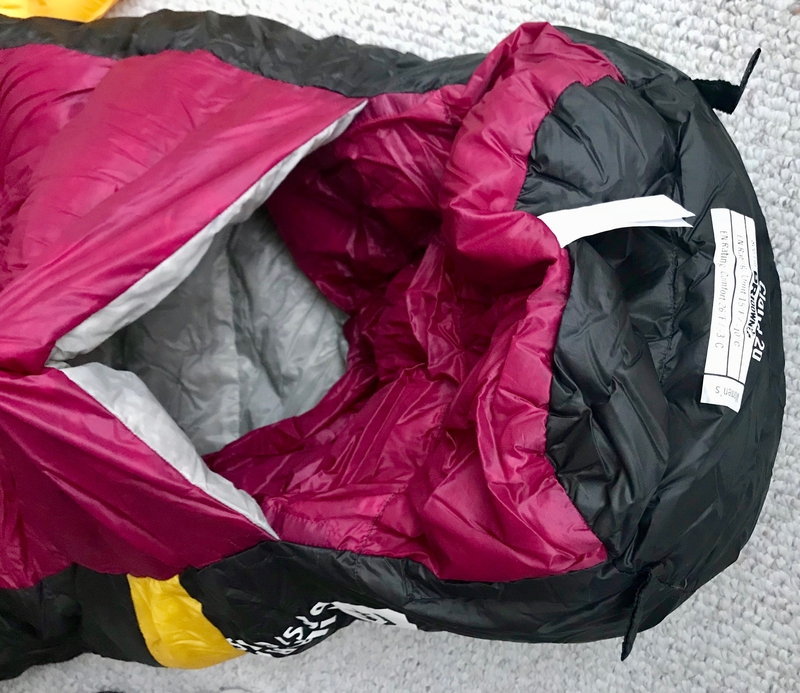 It features a unique design, with an “oversized integrated comforter” which is a fancy way of saying that there is a large flap of fabric that the user can leave open or tuck into the bag to keep in the heat. It also has a “self-sealing footbox,” which allows the user to pop their feet out on warmer nights or keep his or her feet in without feeling a draft. It differs from a quilt in that it still has the shape of a mummy bag, and cannot be formed into the shape of a blanket. Additionally, there is a half sleeve in the back to keep a sleeping mat in place. I slept in this sleeping bag during multiple backpacking and camping trips this fall; mostly in the eastern United States. Being in the east, overnight temperatures varied from 20-50ºF and conditions skewed towards being rainy and damp. I tested the bag in a 3-season tent, and with a Sea to Summit UltraLight Mat (R-Value 0.7). For reference, my past sleeping bag experience includes nobo thru-hikes of the Appalachian Trail and Pacific Crest Trail, as well as countless other nights sleeping in the backcountry. On the PCT I used a 20ºF lightweight bag. Hiking the AT I started with an aforementioned 20ºF bag in March before switching to a 35ºF ultralight bag in May. I enjoyed sleeping in the Cloud. The 800-fill down created a comfortable puff. When I first started backpacking in 2002, I was resistant to the mummy bag. Despite my petite frame they always felt too constrictive; however, many backcountry nights later I’ve gotten used to the shape and the warmth that they trap in. Although I’ve become accustomed to a traditional mummy bag, this updated one was a dream for me. As a side sleeper, the integrated comforter allowed me the ability to sleep on my left side and tuck in the comforter, allowing for sleep more similar to a bed and blanket set-up. Although the footbox doesn’t zipper closed, it’s “self-sealing” properties worked, and I never experienced a draft. The best thing about this bag is that it allowed me to dial in on my heat regulation better than any other mummy bag I’ve encountered. My previous 20ºF bag was perfect on cold nights in the Sierras, but on warmer nights it was too hot. The Cloud allowed me to pop my feet out with ease and leave the comforter untucked to help me regulate my temperature while I slept. It ventilated well, and never got that damp feeling that my other sleeping bags have gotten in the past. I have only used a sleeping bag with a longer sleeve for a mattress on a week long backpacking trip, and never how it felt. I had a difficult time turning over in my sleep. The Cloud’s half-sleeve allowed for the bag and mattress to stay together without making me feel as if I were glued to a board. A thin piece of fabric replaces the down-fill in an area a little larger than a square foot on the back of the bag. I didn’t notice it until after a few uses, as I had an inflatable mattress; however, when tested with a foam mattress it is quite noticeable. Sierra Designs Cloud bag is a great value and affordably priced. While there are less expensive 20ºF down bags out there, most are half a pound to a pound heavier than the Cloud. Sleeping bags with a similar temperature-rating and weight are typically more expensive than the Cloud. 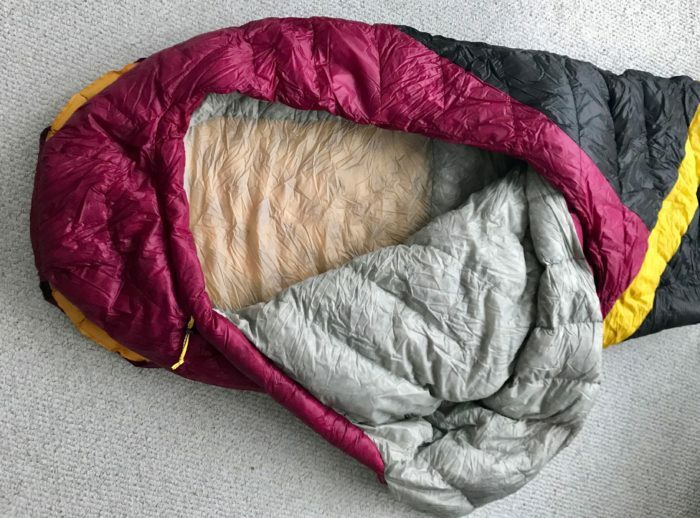 This bag is good for side-sleepers, those thinking about a quilt but not sold on ditching the mummy bag altogether, and for anyone embarking on a long distance hike where overnight temperatures will fluctuate from mid-20ºF to mid-60ºF throughout the journey. The Cloud is currently available for pre-order from Sierra Designs online and will start shipping January 3rd. Disclosure: this product was donated for the purpose of this review. I'm known as Amy off the trail, and Tuff Broad on the trail. I hiked the PCT in 2016, and the AT in 2017. Hiking helps me take myself a little less seriously, makes me grateful for these legs of mine, and reminds me how much I like Cheetos. I could eat macaroni and cheese every day. If you'd like to read about what other foods I like, and the trails that I've hiked, you can read more at my personal blog http://www.cookingscraps.com. Interesting concept. Still Leary about using things that I’m used to using. We’ll keep an eye on it. ??? Hi Amy. I’m very much interested in a similar sleep system combo as you tested here, but have a question. The pad sleeve on the Cloud bags say that it accommodates a maximum pad size of 20″ wide by 2.5″ high, yet I see you used the Sea to Summit Ultralight pad, which is 21.5″ wide. So it’s slightly wider than the sleeve is supposed to accommodate, but, your pad is only 2″ tall, not the 2.5″ max, so perhaps that’s why it fit. I was actually interested in pairing the cloud with the Sea to Summit Comfort Light pad, which is the same shape and 21.5″ width as your Ultralight, however it is the full 2.5″ thickness, not the 2.0″ of the Ultralight. In your opinion, do you think that 1/2 inch thicker variant of the pad you used would still fit in the Cloud’s pad sleeve? It doesn’t look like it’s elastic or flexible material, so I’m curious just how snug a fit it actually was when you used it. Thanks! I didn’t have any issues getting my slightly wider pad in there, and I imagine if it were a half inch thicker it would have fit as well as it wasn’t a snug fit. The sleeve has openings on the top corners and is tapered, and the sea to summit mat is tapered as well, so perhaps that’s why it was able to accommodate the slightly wider pad. My instinct is that it would still have work had the pad been a half inch thicker.